Well friends, it’s that time of year again; this month, on September 20th, we solemnly observe Unification Day. For those of you aren’t aware, that is the day in the Firefly/Serenity universe in which the Alliance defeated the Browncoats, and re-unified the the two factions. It’s also, the day where I don a brown trenchcoat and try to pick a fight in a bar… Not really, but pehaps someday. Yes, I love Serenity that much. I’ve been asked why it’s one of my favorite films; aside from it being such a cult-classic, and tapping into a little-explored “cowboys in space” genre (Cowboy Beebop anyone? ), I have to say, that the most compelling reason, is it’s grace. Call me hokey if you want, but the film plays like a ballet. From the very start, whether intentionally or unintentionally, it cuts like a Satoshi Kon film, originating in a dream, or perhaps partial memory, transitioning to a security recording, and then finally to the scene of the operative in the records room. You aren’t just watching a story, you’re being pulled through it. Even if you don’t know the series “Firefly”, as I didn’t when first watching this film, you are given everything you need to know right away, and then ushered along to the rest of the story. What I’d like to do in this film analysis, is break it down into what I consider to be main turning points in the film, and discuss how those work to bolster the film as a complete package. You’ll see me do this a lot in my film studies, and especially with the first fifteen minutes. Personally, I think “the first fifteen” are some of the most crucial minutes in a film. I’ll let almost anything slide if a precedent has been established in the first fifteen minutes. As the viewer is introduced to this new world, I believe a filmmaker has free reign to establish the characters they want, the environment they want, and whatever laws of a universe they want. If a film wanted to set a precedent for talking animals, or some impossible law of physics, for example, that’s perfectly acceptable within this time frame. But don’t try to tack it on 45 minutes into a film; it just won’t work. It breaks the reality the viewer has become accustomed to. The first 15 minutes are pretty much the raw canvas on which you paint your story. The world is yours to describe. The first fifteen – 4 minutes, 24 seconds. That’s all it took for Joss Whedon to introduce the meat of the characters in a “single take”, a.k.a the oner (won-er). I put that in quotes only because I know filmmakers have their slew of hide-a-cut techniques, so this may not be a true oner, but it’s still a fantastic piece of cinematography. That’s not to say that a single, obnoxiously long cut is what every film needs, but when it works, my God does it work (can you tell I like Tony Zhou’s work yet?). 15 minutes in, we have our back-story, the main characters and a major antagonist. We even have a look into the politics of the known universe; Alliance vs. Browncoats. But why are these things so important? It gives the story teller, and the viewer, the entire rest of the film to explore the story. And this gives the story teller immense power. Speaking of immense power, I just want to say, in my opinion, it’s in these first fifteen minutes that Simon shows himself to be perhaps the most fearless character of the crew. It’s unfortunate that he never really gets another shot at proving this, but he willingly takes on an Alliance installation BY HIMSELF, expends his entire fortune, destroys his reputation and leaves the rest of his disbelieving family, to rescue his little sister. Talk about balls. Vault robbery – During the heist, we are reminded of the over-arching political issue driving this (literal) universe: the Alliance wants to control the population, while there are those like Mal and the Browncoats, who want independence. Here it is also confirmed that our main characters are what everyone else sees them as; petty thieves. They scratch out a living where they can and when Mal is given a chance to offer a retort to the old man’s comment, Mal seemingly accepts that “petty theiving ain’t exactly soldier’s work”, with a simple “the war is long done”. His time for being a hero is done. Perhaps my favorite part of this scene, however, is the camera move as River points out a potential trouble maker. We float, like a “leaf on the wind”, which will of course become important again later. It’s the only time we see a camera move like this, but sort of illustrates River’s natural grace, in the process. After the plan is interrupted, Mal puts the would-be-hero out of his misery once he is captured by the Reavers, and gets a talking-to from Zoe about not having left a man behind during the war. This is twice now, in the very early moments of the film, that Mal rebuffs his image of an honorable soldier, and tries to craft himself as the briggand. We get the feeling that he tried being the better man once, but was beaten. Now he either wants to forget that man of the past, or simply doesn’t want to be beaten again. Triggered – Perhaps one of my top 5 favorite moments in this film, River is triggered by the subliminal message hidden in the “Fruity Oaty Bar” commercial, which I highly recommend you see in it’s entirety (not mandatory). She then proceeds to tear the place apart, and show a side of her that we really hadn’t seen before in the TV show; River as a weapon. It’s here, also, that the film makes a radical shift; Mal was already set on Simon and River leaving the crew, and yet he’s the one to carry her out of the bar and rescue them both from the Alliance. As much as Mal doesn’t want to admit it, he wants to be a hero. Whether Mal truly sees them as part of his crew, or if Zoe’s words simply got to him earlier, Mal “doesn’t leave a man behind”, and begins to take on the role of the savior, or deliverer. Campfire with Book – Never underestimate the power of faith. That, and a badass priest. I’m seriously disappointed that we never got to see Shepherd’s backstory in the show, but there IS a graphic novel called “Serenity: The Shepherd’s Tale”, where we get to see more of Book’s past. Outside of this though; one can only speculate what kind of character Joss Whedon was trying to build within him. In one episode of the show, Shepherd was injured and brought to a hospital; his ID scanned, and quickly ushered to the ER. In another, a bounty hunter exclaims “that ain’t no Shepherd”, and by his own admission “I wasn’t always a Shepherd, Mal”. So we can deduce that 1) he’s a badass, 2) he’s probably killed people and 3) did I mention that he’s a badass? It’s here though, that Mal shows a side of himself that we rarely see; his vulnerability. He’s starting to waver in his resolve and ability to come out of this alive. It’s likely that he confides in Book because Mal used to be a man of faith. While he makes it clear here that he’s no longer that man, it’s possible old habits die hard, and Mal yearns for that comfort. You could call this a “Merlin” moment; Mal needs something in order to be able to forge ahead. A tool, some words of wisdom; and he gets this from Book, an older, wiser character. Book’s death – I’m going to fast-forward a bit, and jump to Book’s death at Haven. While the other portions of the story are indeed influential, I think it’s important to take a look at the juxtaposition that occurs here, and the “prophecy”, so to speak, outlayed by Shepard book, and it’s fulfilment at this point. during Mal’s conversation with Book, he was told “a man like this believes hard” and “he’ll come at you sideways”. Mal responded by saying, essentially, “[You’ll have to tell me how a Preacher knows so much about that]”, and Book, still being a badass; “No, I don’t”. The viewer is left of course, wanting to know more about his past and hoping that Book will change his mind. But we soon see his last words, asking Mal to “just believe”. His death solidifies that Mal in fact, won’t hear Book’s tale, and neither will the viewer (at least, not in this film). Mal takes command – With any compelling story, you’ll find that moment when the hero seems knocked down, nearly out, and almost ready to throw in the towel. Without this important element, a story really isn’t as interesting. Perhaps someday I’ll write a review of a film that is missing exactly this, and explain why it causes it to fall apart, but a story really needs this sort of eb and flow, or it just isn’t interesting. The viewer actually NEEDS to believe the hero really might fail. And then, to see the hero overcome whatever obstacles still lie in his or her way. It’s here that in a film, act II usually ends, and act III picks up steam. This is where the story begins to approach it’s climax. It’s at this point that the story takes a drastic turn; until now, the crew has been focusing mainly on evasion. But now, they must take the offensive if they hope to survive. Mal must reassert himself as the leader of his tiny crew, and quash their fears before they disintegrate. It’s after this scene, that even as the viewer, you’re either encouraged by his resolve and want to follow him, or simply too terrified to disobey him. Either way, he’s brutally effective at rallying the crew. Admittedly, they’ve suffered quite the blow; the murder of any and all who gave them shelter, whose only crime was coming to their aid. It’s a harsh burden to bear, knowing that these people died because of you, and I think this is the moment where Mal decides the gloves come off. He reaches deep within to find the guts to take on the operative, and the Alliance fleet, and oh yeah, a horde of hungry, angry, space pirates known as Reavers. Nothing says “obey me” quite like shooting a man in the chest and then grumbling the words “get to work”. Miranda; River gets answers – After making their way past the Reavers and onto the planet Miranda, it’s here that we learn the Reavers were of the Alliance’s own creation, and see just how far their desire to control people can go. River has her ultimate breakdown moment, but it’s also perhaps the most constructive for her. Remember, if you’ve followed the series, River struggled for I’m guessing almost a year, with this secret hidden inside her own mind. She’s been unable to assemble the pieces, and it’s very nearly driven her mad. It’s only now, once everything becomes clear to her, that she’s able to breathe a sigh of relief… after throwing up of course, which I suppose is symbolic too. Mal has a plan – The big fight, the destruction of the ship, Wash’s death, and the lucky happinstance of finding a slew of bullet-proof crates. All of this happens pretty quickly, and in the course of just a couple sequences. It’s an admittedly brilliant way to both zoom through, and tie up nicely, some parts of the plot, and quickly get us to the meat of the climax. Drawing the Reavers’ fire to nearly annhiliate the standing Alliance fleet is another example (among many others from the show) of Mal’s military genius. 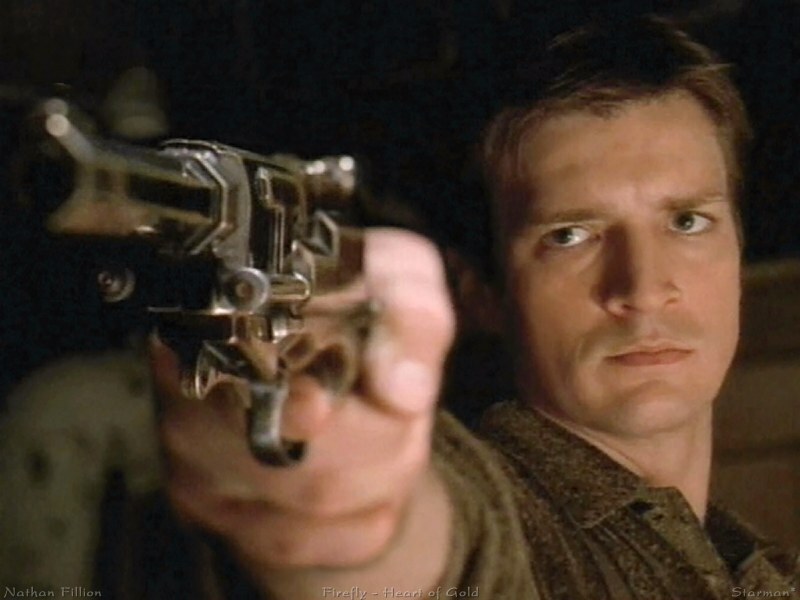 I’d imagine we are to believe that if Mal was given the chance, he could have lead the Browncoats to victory. The ship’s crash-landing and death of Wash is meaningful in two big ways: for one, it’s the loss of another main character, not to mention perhaps one of the most beloved. So, if it wasn’t clear before, the show definitely isn’t coming back. Sadness :( Second, with the pilot dead, the ship destroyed, and as Jayne said “two armies versus our one bitty cannon”, there is almost no possibility of this crew making it out of here alive. Not without some serious luck, or… an elite military super-weapon. River’s turn – Finally, after what feels like years of waiting, River gets her time to shine. She is no longer trapped by her past, controlled by an overwhelming force or terrorized by memories that her not her own. This is the moment when River is truly free of all that once bound her, and she willingly unleashes her greatest power to protect the ones she loves. I have to admit… I wish this fight scene were longer, and gorier. Though from a cinematic standpoint I absolutely love the shot of a single drop of blood dripping from the battle axe. River looks almost willing to get riddled with bullets as the Alliance men are told to stand down. She’s fearless, fueled by the love of her sibling, as was Simon was at the beginning of the film, and it’s an incredibly powerful scene. A world without sin, and an unblinking realization – Up until now I haven’t really focused much on the character of the “operative”. Not because he isn’t important, but because really, he represents the whole of the Alliance. He is their long arm of justice, the ever-present threat, and unrelenting pursuer. He’s not just one man. When he and Mal speak on the “wave” immediately following the destruction of Haven; Mal snipes, “I don’t murder innocent women and children”. “I do”, was the operatives reply. Most all of us have heart enough to acknowledge that for an individual, this as a pretty cold and cruel answer. No remorse, no denial. Now think of him, not as an individual, but as the Alliance personified. Imagine it’s a corrupt government speaking; protecting it’s own interests. He may even see himself as the whole system, embodied in one man. Now that reply isn’t just cruel, it’s monstrous. And yet, it seems a little bit more par for the course, doesn’t it? Seeing him as THE Alliance, completely changed my perception of his character. Going forward with that aspect, it adds even more weight to the scene of the operative learning the truth behind the Reavers. What got me the most, is that we already know what the operative is watching, and rather than showing us a second time, Whedon, and DP Jack Green chose to focus on the operative’s face instead. It’s the moment when he is ripped apart from being one with the Alliance, and becomes his own character, with his own mind. We know what he’s watching and we know how it ends. It’s a horrible thing to witness; even after having seen this film a dozen times, the look on the woman’s face as she can’t bring herself to take her own life is… well, I’ll be honest, it’s somewhat haunting. And yet, the operative watches void of emotion. Unblinking. Unmoved. I still have yet to decide for myself if this is because he’s just seen so much death already that nothing phases him, or if he holds so much regret for his actions that he’s literally in shock; believing he deserves to watch something so horrible. I’m leaning toward the latter, but I guess I’ll never know for sure. Passing through the storm – Serenity, marks the beginning of a whole new path for Joss Whedon. I have a sneaking suspicion, that he knew all along he was capable of delivering more than Television shows like Buffy or Angel. Both of which can stand in their own right, but there is no denying that Serenity, is of an entirely different caliber. The over-riding theme of this film is belief. Belief can be a motivator for some truly amazing good works, but it can also be used to drive some of the worst. At the end of Serenity, our heroes casually fly through a storm-filled sky, and into the peacefulness of outer space (until, y’know, buffer panel). We’ve seen two major opposing forces; the belief to be free from oppression, and the belief that oppression is what’s best for mankind. Not unlike many tales of world history, a people or society must first pass through the storm of war, before breaking free of their oppressors. So you could argue that this last scene is a summation of the film’s motif, and resulting conflict that must first be “passed through” before reaching the peace and freedom Mal and the rest of his crew so desire. Hopefully, someday, we’ll get to see more to this story.